BETHESDA, MD--(Marketwire - November 22, 2010) - Since Chicago physician James B. Herrick published the first description of sickle cell disease in Western medical literature over a century ago, researchers have made great progress in the diagnosis and management of the disease. The search continues for improved treatments and cures to help those who have sickle cell disease, thanks in part to research funded by the National Heart, Lung, and Blood Institute (NHLBI) of the National Institutes of Health. Sickle cell disease is a genetic disorder that affects between 70,000 and 100,000 people in the United States, the majority of whom are African American or Hispanic. People who have the disease inherit two copies of the sickle globin gene, one from each parent. 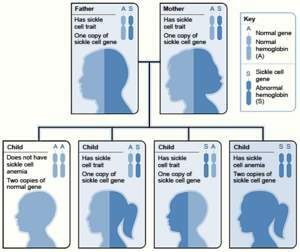 Those who inherit only one copy of the gene do not have sickle cell disease, but have sickle cell trait instead. While people with sickle cell trait typically have few, if any, complications, they can pass the sickle globin gene to their children. Normal red blood cells pass easily through blood vessels. Sickled cells tend to be stiff and sticky and can block blood vessels, which can lead to serious infection, organ damage, and pain crises. A crisis is a debilitating episode of sudden pain that can affect a person's bones, lungs, abdomen, and joints, and almost any other part of the body. 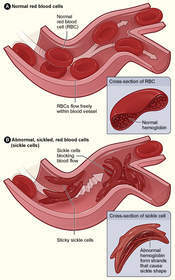 Sickle cell disease also causes life-long anemia. The disease lowers the quality of life for families affected by it. Today's available treatment options help many, but not all patients have access to proper treatment and care. While bone marrow transplants have cured some patients, a scarcity of matched donors prevents this option from being widely available. 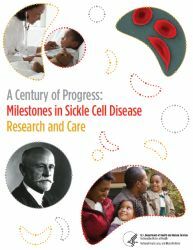 The NHLBI has supported sickle cell disease research since 1948, and has invested more than $1 billion in sickle cell research since 1972. In the 1970s, life expectancy for individuals with the disease was about 14 years. Today, many individuals live into their 40s or longer. Research on hydroxyurea, bone marrow transplantation, blood transfusions, and antibiotics has led to treatments that help patients live longer, healthier lives. The NHLBI currently is exploring ways to improve treatment of the disorder and reduce the risk of serious complications, such as stroke, pulmonary hypertension, respiratory problems, and vulnerability to infections. Researchers are also testing ways to make bone marrow transplants more widely available. Clinical practice guidelines to help providers are expected in 2011. Part of the National Institutes of Health, the National Heart, Lung, and Blood Institute (NHLBI) plans, conducts, and supports research related to the causes, prevention, diagnosis, and treatment of heart, lung, blood vessel, and blood diseases, and sleep disorders. The Institute also administers national health education campaigns on women and heart disease, healthy weight for children, and other topics. NHLBI press releases and other materials are available online at www.nhlbi.nih.gov.